It’s been an exciting week for fans of the Red Planet. Within seven days, one robot successfully landed on Mars and another got its long-awaited landing spot: the Jezero Crater. Robin Wordsworth, Assistant Professor of Environmental Science and Engineering at the Harvard John A. Paulson School of Engineering and Applied Sciences (SEAS), participated in NASA-run workshops to help choose landing sites for the Mars 2020 rover mission. 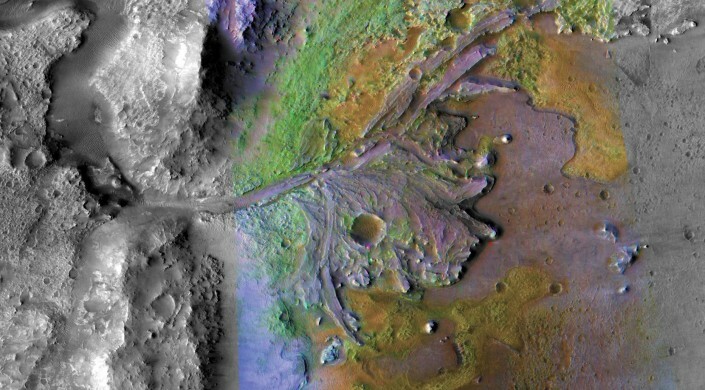 Wordsworth, whose group models the ancient Martian climate and water cycle, is excited about Jezero Crater as a landing site in part because it offers a window into the very early climate on Mars. We spoke with Wordsworth about the decision. Why is Jerezo Crater interesting to you? Wordsworth: Jezero Crater is fascinating because it contains a beautifully preserved river delta that formed billions of years ago, likely not long after Mars itself formed. It therefore provides us a window into conditions on a potentially habitable planet in the very earliest period of the Solar System — a time period that has all but been erased from the geological record on Earth. It’s of great interest to us both in terms of planetary science, because it will allow us to investigate the early climate, but also astrobiology, because it could contain signs of early Martian life. How does your research tie into the mission to Jezero Crater? We’re researching the climate and hydrology of early Mars using a range of models, including some that are similar to those used to make predictions of climate change on Earth. We’ve already used our models to make global climate predictions to help with landing site selection (this is the work I presented at the 3rd landing site workshop last year). Now, we plan to apply our models to Jezero directly to understand the likely environmental conditions when the delta was forming. In turn, new data from Jezero is going to help us constrain our models and come up with a much more comprehensive picture of what early Mars was like. What are you most excited to see when the new rover finally arrives at the site in 2021? I’m incredibly excited by the potential to gain better insight into the duration of the warm episodes from the detailed geology on the surface, particularly the geomorphology. Beyond that, I’m really excited to see if the Jezero delta contains evidence of organic carbon in its sediments, which would be a strong suggestion of biological activity in the lake when it was forming.